North Star Cruises Australia has sailed into 30 years of continuous operations. 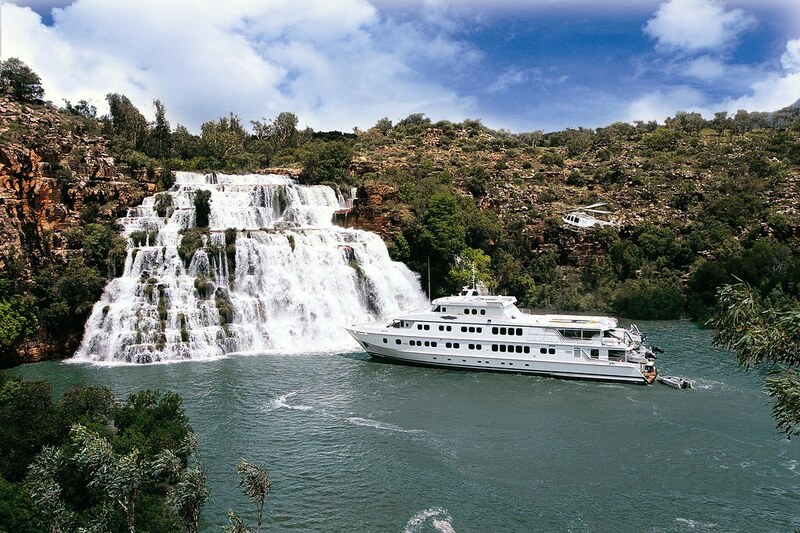 The now revered adventure-cruise operator first cruised Western Australia's remote Kimberley coast during 1987 when founding director Craig Howson commenced fishing type charters along a coastline that was and still is largely inaccessible from land. Howson discovered that the Kimberley was a haven for adventurers who were easily spellbound by more than 2,500 rugged islands and numerous navigable river systems crowned with stunning gorges and majestic waterfalls. When he mixed-in some of the best sports fishing action that you could imagine, unique wildlife encounters and, opportunity to see pristine examples of ancient rock art - the recipe for success was almost complete. The last ingredient was making sure all could be enjoyed 'in style' and in 1999 North Star launched the first TRUE NORTH – a 28-guest adventure-cruiser that was more akin to a floating boutique hotel complete with a roof-top helicopter. The Rowley Shoals, 300 square kilometres of undisturbed coral that conveniently lay off the Kimberley coast, added to the already sumptuous 'menu' and an annual repositioning cruise along the West Australian coast also quickly developed a strong following. The TRUE NORTH was soon boasting sales more than 2 years in advance and in response North Star launched the current 36 guest TRUE NORTH. The bigger boat introduced greater operational capability and with North Star's loyal following ever-clambering for new destinations the company was able to expand its horizons. In its launch year the new TRUE NORTH began exploring the picture perfect islands of Papua New Guinea and much like the Kimberley, the area became an instant hit with the adventure-hungry. In more recent times the company has added the Raja Ampats and Komodo Island to its busy sailing schedule. Featuring a shallow draft that allows the TRUE NORTH to go where bigger ships cannot, an exceptionally high crew to guest ratio of 22:36, six dedicated expedition boats and a ship's helicopter – there are few other examples of craft so keenly configured for discovery and adventure. North Star's itineraries also never depart from theme – sea days are specifically excluded to ensure that every day on-board is an activity day and each day of every itinerary features multiple activities. The reoccurring theme really is tailor-made for the holiday-maker who is looking for much more than a holiday! North Star is planning to celebrate the milestone year with several end of year cocktail parties on-board the TRUE NORTH and, a gala event is scheduled to be held in Broome during May 2017.